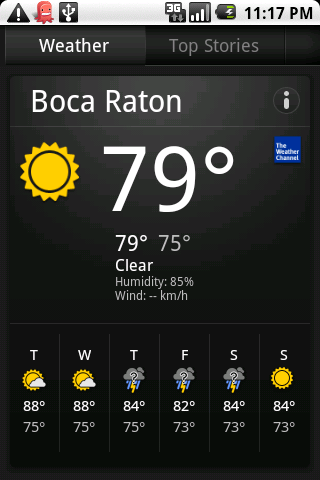 Why doesn’t my phone have a thermometer? It’s get­ting pret­ty warm again (did it ever stop?) in South Flori­da, so today when I had the mis­for­tune of being out­doors, I got to won­der­ing why with all the sen­sors found in most mod­ern smart­phones, they don’t usu­al­ly include a ther­mome­ter. It’s com­mon to find sen­sors for ori­en­ta­tion, screen contact/pressure, video, sound and even loca­tion. How­ev­er, for some rea­son, the task of telling me about the cli­mate sur­round­ing me gets out­sourced to a third‐party that is some­where com­plete­ly dif­fer­ent. Just think about that for a sec­ond. On the oth­er hand, I can think of rea­sons why our phones tend not to han­dle their own tem­per­a­ture read­ings. Wire­less car­ri­ers obvi­ous­ly pre­fer that cus­tomers pay for data plans to use as many phone fea­tures as pos­si­ble. There’s also the mat­ter of expec­ta­tions: nobody (but me!) seems to demand the fea­ture, so why include it, even if the hard­ware couldn’t be all that pricey? But most impor­tant­ly, the sen­sor would like­ly be undu­ly influ­enced by the tem­per­a­ture of our hand, the atmos­pher­ic con­di­tions in our pock­et, the heat gen­er­at­ed by the phone itself, and so on. 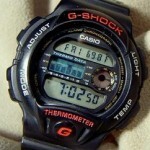 Heck, I dis­tinct­ly remem­ber how wild­ly inac­cu­rate my circa‐mid‐90s Casio G‐Shock ther­mome­ter watch (same mod­el pic­tured at right) was. I can’t quite place my fin­ger on what I would do with the abil­i­ty to keep a read­ing of my own sur­round­ings’ tem­per­a­ture over time… but I know I want it. Inter­est­ing. I’ve actu­al­ly nev­er thought of that before, but a ther­mome­ter would be real­ly cool to have. 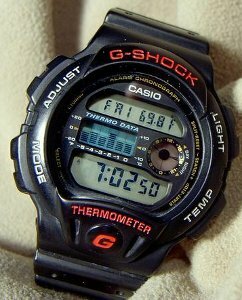 Side note: I remem­ber when I was lit­tle won­der­ing what the bar graph on the G‐Shock was for, but hadn’t thought about it in years. Ques­tion answered! Next Next post: It’s fear, mostly.